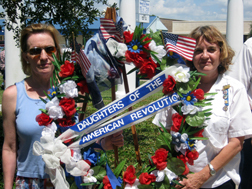 For more than 50 years, our chapter has continued the traditions of providing the DAR Good Citizens Award to students in area high schools, DAR Youth Citizenship Medals to 7th and 8th graders in local junior high schools, sponsoring the American History Essay Contest, and collecting gifts for the patients in the Michael DeBakey Veteran's Affairs Administration Medical Center in Houston. The John Lewis and Goose Creek Chapters merged in 1997, creating a single chapter for Baytown. We meet monthly, either on Monday afternoons, or Saturday evenings. If you are interested in membership, contact: Melanie Ferguson.